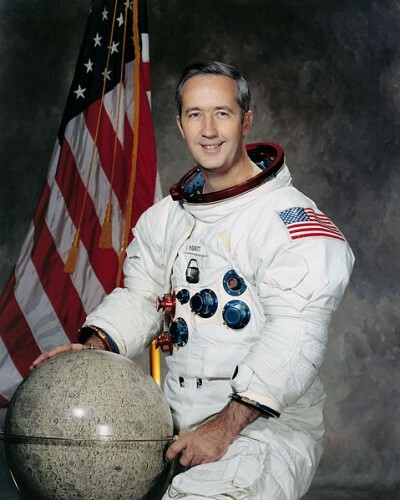 James A. McDivitt commanded both the Gemini 4 first space walk mission and the Apollo 9 flight in which the Lunar Module was tested for the first time in earth orbit. He was born June 10, 1929, in Chicago. He received a Bachelor of Science Degree in Aeronautical Engineering from the University of Michigan in 1959, graduating first in his class; an honorary Doctorate in Astronautical Science from the University of Michigan in 1965; an honorary Doctor of Science from Seton Hall University in 1969; an honorary Doctor of Science from Miami University (Ohio) in 1970, and an honorary Doctor of Laws from Eastern Michigan University in 1975. McDivitt joined the Air Force in 1951 and retired in 1972 as a Brigadier General. He flew 145 combat missions during the Korean War in F80s and F-86s. He is a graduate of the USAF Experimental Test Pilot School and the USAF Aerospace Research Pilot Course and flew as an experimental test pilot at Edwards Air Force Base, California. He was selected as as astronaut by NASA in 1962. He was command pilot for Gemini 4, a four-day mission that began June 3, 1965. It featured a 21-minute space walk by astronaut Edward H. White II, the first extravehicular activity by a U.S. spaceman. He commanded Apollo 9, a 10-day earth orbit flight launched March 3, 1969. His crewmates were David R. Scott and Russell L. Schweickart. The flight was the first test of a complete set of Apollo hardware, including the Lunar Module. McDivitt and Schweickart separated the LM and flew 113 miles away from Scott and the Command Module before flying back to a rendezvous and linkup with the mother ship. He became manager of lunar landing operations in May 1969 and led a team that planned the lunar exploration program. In August that year he became manager of the Apollo spacecraft program and was program manager for Apollos 12, 13, 14, 15, and 16. He left NASA in 1972 to enter the business world. McDivitt retired in 1997 as Senior Vice President, Government Operations and International, Rockwell International Corp., based in Arlington, Va. He and his wife, Judy, live in Rapid City, Mich.
James McDivitt was inducted into the U.S. Astronaut Hall of Fame on March 19, 1993.